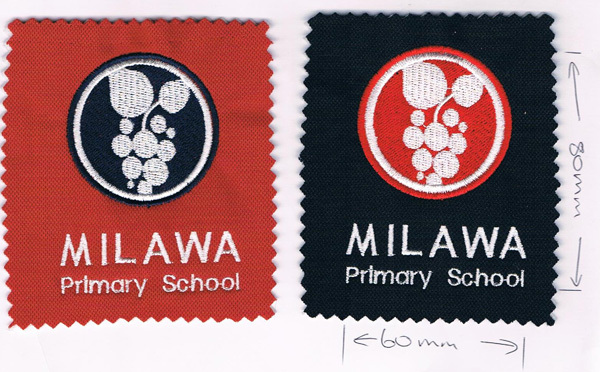 The refreshed Milawa Primary School logo carries forward the existing ‘grape’ icon and colours symbolising the strong connection to community and the regional world class grape growing and wine industry. The refreshed symbolism represents the individualism of the students with in the school community. It portrays ideas of grouping and working together and a learning journey of growing, building and consolidating. We have two variations of the logo for our school uniforms. The size including text should be 60mm W x 80mm H.
Version 1: Navy logo with white text on red background for our school polo shirts. Version 2: Red logo with white text on navy background for our school bags.